Marie-Thérèse Maurette is one of the most enigmatic figures in the development of international education. She emerged from a generation where a new approach to education represented a beacon of hope in a world rocked by war and ideological divides. From its crucible following the creation of the League of Nations to its revival from the ashes of the second world war, Maurette's influence extends well beyond the International School's formative years. Her biography offers an extraordinary view of the emergence a unique educational institution, one that is inextricably linked to the world as a whole. The highly respected educator George Walker brings his considerable experience to the forefront in a compelling narrative that explores a period of great hope and overwhelming challenge. 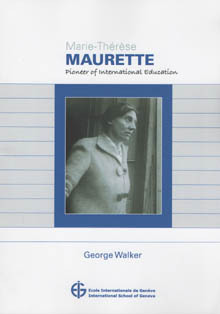 His book Marie-Thérèse Maurette - Pioneer of International Education combines extensive historical research with his recognized academic expertise to provide the reader with an honest perspective and a realistic portrayal of a very remarkable individual. George Walker was himself a successor to Marie-Thérèse Maurette, serving as Director General of the International School for eight years before becoming Director General of the International Baccalaureate. In his early years, he studied chemistry at Exeter College, Oxford, gaining both MA and MSc degrees, and went on to become a lecturer in the department of education at the University of York. 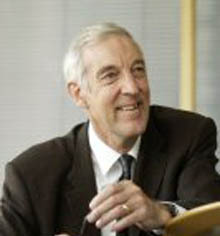 Extending a distinguished career in comprehensive education, Walker was appointed Officer of the Order of the British Empire (OBE) for his contributions. George Walker was awarded the honorary degree of Doctor of Education from the University of Bath, where he is a currently a visiting professor. Along with other founders of the International School of Geneva, Marie-Thérèse Maurette responded to a unique opportunity to bring together students from all parts of the globe in an environment that builds upon mutual understanding and cooperation. As headmaster, Maurette accomplished the daunting task of putting these principles into practice even as the international situation cascaded into the abyss. She maintained the school during the darkest period in world history when others around her had by necessity abandoned the scene. Not simply a voice from the past, the message communicated by Marie-Thérèse Maurette continues to resonate well into the present. 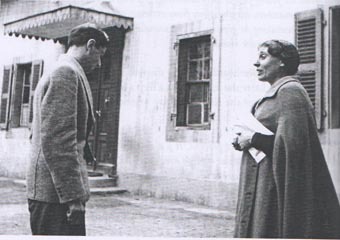 Her report to UNESCO in 1948 entitled Techniques d'education pour la paix. Existent-elles? drew upon her experience at Ecolint and remains one of the most significant contributions to the principles of international education. This report to UNESCO addresses the central question of how to educate people to become members of the human race as a whole in addition to being citizens of separate nations. She wanted to enrich her students' shared experience, living and working among widely differing cultures, together with the art, literature, and traditions which characterize them.